Posted September 21, 2018 by Dr. Ehrenman & Dr. Khan & filed under General Dental Articles, Mouthguards, Oral Care, Prevention. As the fall sports season gets underway, it’s a fitting time to talk about the importance of sports mouthguards. An estimated one-third of all dental injuries are sports-related. Our pediatric dental office in Long Island wants the parents of our patients to know that most of these injuries can be prevented by using a properly fitted sports mouthguard. A mouthguard will greatly reduce the risk of all of these injuries. 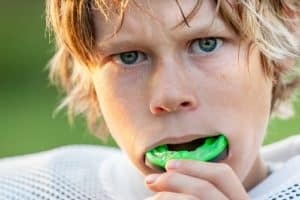 There are types of sports mouthguards that can help protect your child: Stock, Boil-and-Bite, Custom. Let’s take a closer look at each one. Stock mouthguards come already formed and are usually the least expensive option. You can find them at any sporting goods store. However, these cheaper options are usually uncomfortable and don’t offer the best protection. Boil-and-Bite options are exactly as they sound — you boil them until their soft and moldable, then you bite down gently to mold them to teeth. While offering a more custom fit, these mouthguard often require trimming, making them less effective. Custom is the way to go for the best protection and most comfort. Custom-fitted mouthguards are created by a dentist from custom molds of teeth, taking each tooth and mouth size into consideration. To keep your child’s mouthguard in good shape and bacteria free, it’s important to take care of it properly. Since kids are always growing and their teeth are always shifting, you should replace a child’s mouthguard every year to year and a half. The main purpose of a mouthguard is to protect teeth from being broken, chipped, or knocked out during competition. But these small pieces of sporting equipment can serve a bigger a purpose, too. Mouthguards can cushion the jaw bones and reduce the risk of concussions. A better-fitting mouthguard will do a better job at protecting both teeth, jaw, and brain. This fall sports season, and during all contact sports, make sure your child is wearing a properly fitted mouthguard at all times. It’s a simple way to save your little one from a dental emergency and your wallet from costly care. Schedule an appointment at our Long Island pediatric dental office to find the best sports mouthguard for your kid today.